Libraries today are so much more than just books. Some, including Wellesley’s Margaret Clapp, include "makerspaces" designed to encourage patrons to learn and create. Wellesley’s Knapp Media and Technology Center is home to several 3D printers. The technology is helping to shape hands-on classroom and community learning. 3D printing is the process of making three dimensional solid objects from a digital file. Jordan Tynes, Instructional Technologist, explained that many departments, especially in the sciences, have been using 3D printing technology to bring concepts into physical form for several years. There has also been a recent steady increase in interest from arts and humanities departments. Tynes said each discipline is using the technology in their own way and offered these examples: some classics departments have fabricated fossils they need to study, but can't physically access; art history classes and the Davis have taken advantages of the opportunities 3D printing and scanning offer for new methods of preservation, curation and exhibition; and some studio arts instructors have created sculptures and exhibition models. Adam Van Arsdale, Whitehead Associate Professor of Critical Thought and Associate Professor of Anthropology, said he uses 3D printing exercises because they "give students a more active role to play in the process and some sense of 'ownership' of the things they have helped create." 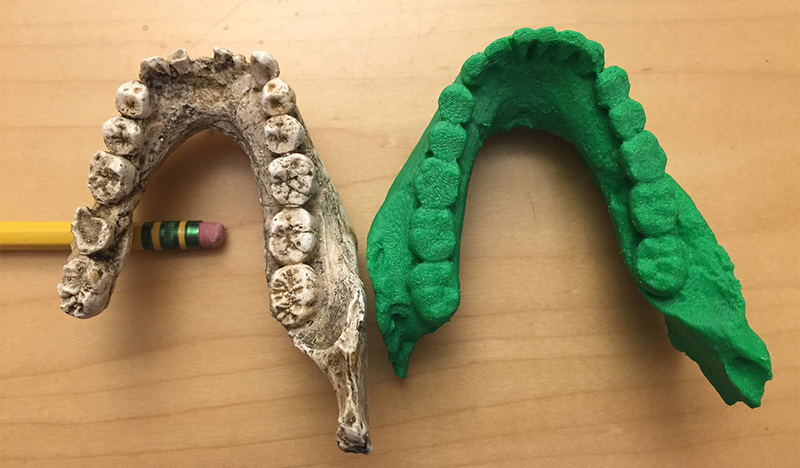 Students in Van Arsdale's Anth 207: Introduction to Human Evolution class, for example, have used the printers to create copies of the recently recovered hominin fossils Homo naledi. "The researchers investigating these fossils have made 3D models of many of the specimens freely available online, so my students were able to print them and use the physical models of them for a final class project," Van Arsdale said. Incidentally, alumna Alia Gurtov ’07 was one of six women chosen to assist in the recovery of the Homo naledi fossils. This coming semester, students in Van Arsdale's Anth 209: Forensic Anthropology class will print 3D models of pathological human bones. "While we have a nice teaching collection of human skeletal material, our collection of pathological specimens—bones showing evidence of disease and/or trauma—is quite limited," Van Arsdale said. "My students will be taking advantage again of freely available online resources, to print out and research specific skeletal pathologies to add to our teaching collection." In a recent article for the Wellesley News, Noor Pirani '19 profiled Make Club, Wellesley's first 3D printing organization. The club, which was founded by Anna Pfoertsch '18 and sponsored by Tynes, seeks to promote the use of 3D printing technology among students and the use of technology in the community at large. Jennifer Chien '19, a member of Make Club, spoke with Pirani and highlighted the detailed thought process and creative problem solving that 3D printing requires. "The machine basically prints in layers from bottom to top—like cutting layers of paper and stacking them on top of each other," Chien said. "So if I was to try and make a bowl...the machine would have to build scaffolds and supports because it can’t build a layer on top of nothing. However, if I were to build the exact same bowl upside down, then it would be easier because you are building a layer on top of the next." Following improvements in technology and an increase in demand, the library recently invested in two new self-service machines. Anyone in the Wellesley College community can use the printers once they've had a very basic orientation. Tynes explained that the orientation process ensures that the printers are being used safely and responsibly. Make Club founder Pfoertsch told the Wellesley News, "Community members at all levels of familiarity and of different backgrounds are welcome to join. All that is needed is an interest and passion to learn."